Facebook is to begin showing UK users more background information about the publishers and news articles they see in the News Feed of the social network. First deployed in the US last year, the test feature places extra context around articles and publishers that appear on the site, including links to Wikipedia pages on the publisher and related articles on the same subject. Facebook said the aim of the feature was to help users "evaluate the credibility of an article and determine whether to trust the article's source". The social network has faced intense scrutiny over its handling of the spread of misinformation on the platform. Earlier this month the company published its internal enforcement figures for the first time, which highlight how much material was removed from the site - it included estimations from the firm that 3% to 4% of its two billion active users were fake accounts. As part of the attempts to offer more context, the new tool also includes options to start following a publisher as well as information on where an article has been shared geographically and who by. It will also show which of a user's friends has shared the story, and also show links to other recent stories by the same publisher. In instances where publisher information was not available or did not exist, the social network said it would also indicate this, saying that this lack of detail can also be helpful context. "We designed these features with feedback and input from a diverse set of people and publishers, including many participants in the Facebook Journalism Project," the firm said in a blog post on the tool. 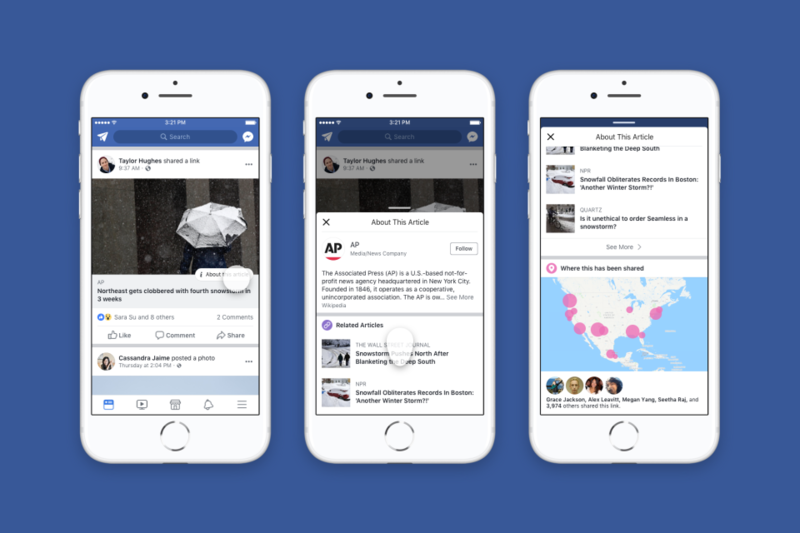 "We'll continue to look for opportunities to improve this experience and help give people more context about the news they see on Facebook."